For complete information and specifications, see the MultiClamp 700B manual. Instantly switch recording modes by using the membrane potential as the trigger. Pre-set a voltage threshold in current-clamp mode, and MultiClamp 700B will automatically switch to voltage-clamp when the membrane potential reaches that voltage level. User-specified delay will allow you to perform creative new experiments. Sudden changes in membrane or pipette parameters may result in undesirable oscillations during whole cell recording. MultiClamp 700B will detect current or voltage oscillations and automatically disable or intelligently reduce compensation settings to protect your cell from damage. 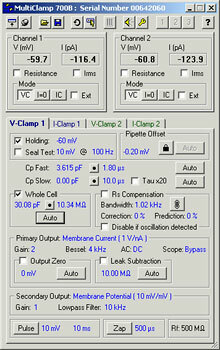 Slight voltage drift—often due to changing electrode properties—may contaminate an otherwise decent current-clamp recording. In order to maintain the membrane potential at a consistent level, MultiClamp 700B will automatically inject compensatory current over a user-defined time course. Instead of the usual front panel knobs and switches, the MultiClamp 700B is controlled by the MultiClamp 700B Commander, a program that runs on a host computer (PC and Macintosh; see Requirements) and communicates with the amplifier via a USB cable. This control interface provides automation of bridge balance, pipette offset, pipette and whole-cell capacitance compensation, in addition to “smart” features such as protection from oscillations and threshold-based mode change. Amplifier settings such as gain, filter frequency, whole-cell capacitance, recording mode and also input / output scale factors are automatically telegraphed to the data acquisition software via “messaging” through the computer operating system. For a more in-depth look at the program, you can download the MultiClamp 700B Commander to try on your Windows computer. Although the MultiClamp 700B is a computer-controlled amplifier, the mouse and/or keyboard is not the only means of controlling the instrument. The optional SoftPanel was designed for those who prefer a more conventional feel to amplifier control. 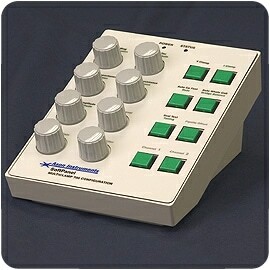 By way of a USB connection, the SoftPanel physically replicates all essential amplifier functions by acting as a hardware extension of the MultiClamp 700B Commander software. SoftPanel knobs replicate continuous mouse controls (“gliders”), while buttons replicate single-click mouse controls. The MultiClamp 700B comes standard with two identical but independent CV-7B headstages, each of which contains both current-to-voltage and voltage-following circuitry. This design allows the user to rapidly switch between patch clamp recording and true high-speed current clamp recording. Thus, with two headstages, the MultiClamp 700B can perform the function of two patch clamps, two current clamps, or a combination of patch and current clamp amplifiers. Furthermore, two optional voltage-follower headstages (HS-2 type) can be connected to auxiliary inputs to allow third and fourth-point voltage recording. HeadstagesMultiClamp 700B supports up to four simultaneous headstages. Two CV-7B headstages come standard; the HS-2A headstages are optional. The CV-7B was designed for low noise and flexible recording features. However, some specialized applications require even more flexibility. For example, the rather large membrane capacitance in bilayer recording demands greater capacitance compensation. The optional CV-7B/BL headstage was developed for this purpose. 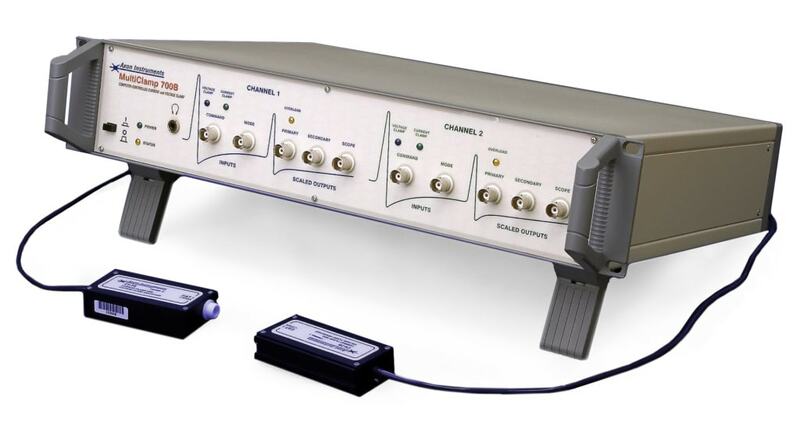 Another optional headstage, the CV-7B/EC, was designed for large (± 2 V) commands required during electrochemistry recording (amperometry, voltammetry). The MultiClamp 700B Commander program runs on the US Windows XP/2000/ME/98 operating systems, as well as Macintosh OS X, version 10.2 or higher (OS 9 is not supported) on a Power PC-based system. A USB port is required to connect the MultiClamp 700B. An additional USB port is required if the optional SoftPanel is used to control the amplifier. Although the MultiClamp 700B is controlled by a software interface, it remains a conventional analog input/output amplifier. Thus, it requires a system for controlling your stimulus protocols and recording the output. Our pCLAMP software and Digidata 1550 digitizer provide the most complete, integrated solution. Note: pCLAMP 9 or higher is required for automatic telegraphing.